Apostolic Revelation: God Can, When We Believe! God Can, When We Believe! When God originally created the whole earth, the Bible says that all the angels sang and rejoiced for what God was doing in His perfect time (Job 38:6-7). All the angels including Satan who was the most beautiful, wise, anointed, talented and favored of them all were part of the team who rejoiced when God created the planet earth. Satan was perfect till the day iniquity of five "I will" to fulfill his own desire made him to transgress God's command, which was to become a guardian for men who were about to be created next on earth (Ezek 28:14-15, 17, 3; Isaiah 14:13-14). Satan was in the garden of Eden initially when God created the heavens and the earth beautifully in His perfect timing before chaos ever came in to our earth (Gen 1:1; Eccl 3:11; Ezek 28:13). But I believe when Satan understood that humans will be created in the image of God and therefore they will be closer to God than him, and that he has to become a servant to them, he did not like God's plan for him to serve them and be a guardian for all humans (Gen 1:27; Heb 1:14). God himself calls Satan as "O covering [i.e. guarding] cherub", because he was created with a purpose to guard the earth (Ezek 28:16, 14). Because "the gifts and the calling of God are irrevocable" (Rom 11:29), God allowed Satan to continue to do the job in spite of rebelling and also taking one third of angels along with him to be like God and form his own kingdom on earth by influencing men who were in the image of God (Rev 12:3-4; Luke 4:5-6). When God was asking Satan, "Where do you come from? ", he said that I am just doing my job of guarding the earth by going to and fro around it (Job 1:7). But Satan's heart was filled with bitterness against God and his children internally. When Satan told Eve, "For God knows that in the day you eat of it your eyes will be opened, and you will be like God, knowing good and evil." (Gen 5:5), Satan was telling the half truth of how she will become like God to take decisions independently apart from God, but not the consequence of the break of fellowship with God. This lie which he projected as truth was his initial wicked desire when he fell from the highest heaven, which is described in the Bible as Satan's first desire in which he desired to "be like the Most High" (Isa 14:14), for which he was thrown out of the highest heaven. Satan knew that once humans break the commandment of God, God will not be able to help them directly because of sin, and as a guardian of them Satan himself could become the chief director of all humans and will become their god eventually (2 Cor 4:4). God formed Adam and Eve in His own image, and seeing them finally together as male and female, God himself felt that it was all "very good" (Gen 1:31). When Satan was jealous of God's idea to create humans in His image he rebelled in his heart first and therefore in his craving to keep the highest power over all created things as he was next only to God (1 John 4:4), he felt jealous over humans and prideful in the splendor of his outward appearance, as a result he corrupted his wisdom which God had gifted to him (Ezek 28:17). To feel proud is not to submit to God's designated authority and to do one's own will apart from God's will. He was thrown out of the highest heaven the moment he desired to be like God in exalting himself above the other creations of God and desired the worship they give which God the Creator only deserves (Isa 14:12-15). But then Satan used his power along with the one third of angels, who also decided to follow him for better life under his regime. Together they destroyed and brought the plan of project earth to come to a grinding halt forever. But little did they realize that our God is infinitely wiser than them all and that he is also omnipotent to do what ever He desires (Isa 46:10-11). So when God went ahead in recreating the chaotic earth, sin of lawless was lurking over the head of man because of the rebellious Satan and his demons who were already living in sin (John 8:44; 1 John 3:8). They wanted to entice man to also sin so that they could take the authority from them and use it to destroy them (Gen 4:7). Sin did not set foot on earth until the day Adam chose to obey Eve and also disobey God's command (Rom 5:12). That day sin deformed man and crumpled his God-image, he began to be crushed by its evil perversion. Satan's plan of a separate kingdom apart from God's universal kingdom began to be projected to humans as an alternative way to live life on earth. In this way Satan took authority over all humans who sinned and began to live independently apart from God, he considered those who sinned as the legal supporters of his kingdom on earth (Rom 6:16; Luke 4:6). So at that time there was no hope for humans who lived under the tyranny of Satan. He began to kill, steal and destroy the humans; as a sadist he hated the image of God in which they were all created (Eph 2:12; John 10:10; James 3:9). Angels are actually created to be servants to humans under God (Heb 1:14), they never had the image of God in them but just the glory of God over them to serve God and his purpose (Psa 104:4). The word of God says, "8 But God demonstrates His own love toward us, in that while we were still sinners, Christ died for us. 9 Much more then, having now been justified by His blood, we shall be saved from wrath through Him. 10 For if when we were enemies we were reconciled to God through the death of His Son, much more, having been reconciled, we shall be saved by His life." (Rom 5:8-10). In other words, if Christ had not come as a human to save us from all our sin of lawlessness (1 John 3:4), we in our sinfulness under Satan and his demonic clutches of wickedness would have forever been lost away from God's Presence and would have ended up in the hell which is the wrath of God for those who reject Him (Matt 25:41). But thank God for dear Jesus who chose to suffer on behalf of us and secure salvation for all of us. We shall be saved in this life through our Lord Jesus Christ. He is the one who will now transform all the believers who choose to trust in the word of God through Him (Rom 12:2). 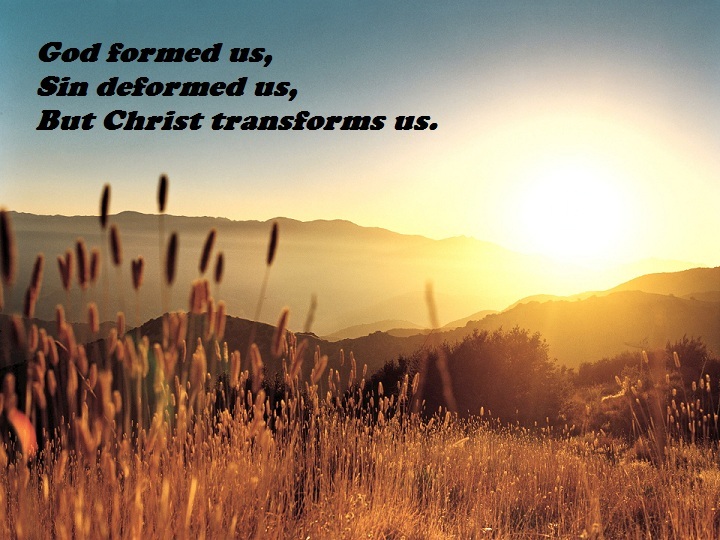 For all those who have received Jesus Christ as their Lord and Savior have now become a new creation and the old deformed image of God have been regenerated and they have become true child of God (2 Cor 5:17; John 1:12). All these believers have been given a supernatural ability to show the true image of God to the whole world around them again, just like Jesus did when he was on the earth. Never again can sin threaten to cause bruises and wounds to us, for God has promised to each one of us that "sin shall not have dominion over" (Rom 6:14) us because we are not under the law which had only the ability to tell us that we are wrong when we sin, but did not give power to overcome sin. Now through Jesus Christ our Lord we can overcome sin which deforms and mars the image of God in us by its wickedness and perversion that accompanies it. Praise the Lord! WHAT WE COULD NOT DO BY OUR ABILITY AND EFFORT, JESUS DID IT ALL AND HAVE INVITED US TO JOIN THE PARTY TO CRUSH SATAN AND HIS SINFULNESS UNDER OUR FEET (Rom 16:20)! Amen!